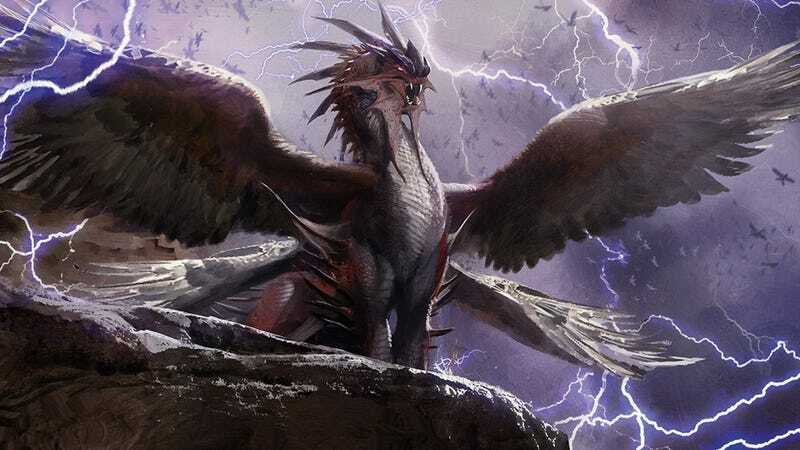 In Dragons of Tarkir, Sarkhan Vol has gone back in time, rescued Ugin the Spirit Dragon, and created a new timeline where dragons control the plane instead of the khans. That means we get a Magic set with more dragons than we’ve ever seen before. Before we jump into the Magic news, I want to take a moment to mourn the passing of Mike McArtor. Mike died in a car accident last week — he’d been the editor of Wizards’ DailyMTG website for years, and had worked with a lot of people on the RPG side of things as well. I never had the good fortune of meeting Mike, but the people who worked with him at Wizards of the Coast and at Paizo shared a lot of touching remembrances and funny stories. Our condolences to his family, friends, and co-workers. So it’s with heavy hearts that we turn to Dragons of Tarkir. By saving Ugin in the past (by putting him into suspended animation), Sarkhan created a timeline in which the dragon-spewing storms of the past never stopped. In this new future, the khans lost their power and the three-color clans dissolved. In their place are two-color clans ruled by legendary dragons (dragons we saw in their younger forms in the last set, Fate Reforged). This plays out as a set just packed with dragons. There’s a cycle of mythic rare dragons (the clan leaders), multiple cycles of rare dragons, and even a bunch of uncommon dragons. Draft or sealed events with this set will have a ton of dragons in play. And the sheer number of dragons available means some of them are bound to turn up in constructed decks too. For EDH/Commander players, there are five new legends to build around, plus dragons for your Kaalia deck (or maybe that evil Changeling deck). Look, there are a lot of freakin’ dragons, okay? Among the more interesting cards in Dragons of Tarkir is a new command cycle, cards that let you choose from a number of different effects each time you cast it. The last command cycle turned out to be a pretty big deal — Cryptic Command will set you back over $50 today. I think all of the new commands are pretty excellent, but I particularly like Silumgar’s Command and Kolaghan’s Command. Not all of the old khans are gone. Sidisi may no longer lead the Sultai clan, but now she’s an Undead Vizier with the ability to Demonic Tutor if you have a creature to sacrifice (she can sacrifice herself, but it’s obviously a lot better if you’ve got some zombie tokens in play). Zombie Sidisi isn’t a huge surprise, but Planeswalker Narset might be. In this timeline, Narset found her spark and became Narset Transcendent, already the most sought after card of the set. This gallery shows off some of the art from Dragons of Tarkir — you may notice there are a lot of dragons. What are you planning to do with all these new dragons? Do you have an aggressive Stndard deck with Atarka? Using Dromoka as your commander? Top image: Dragonlord Kolaghan by Jaime Jones. Atarka’s Command by Chris Rahn. Dragonlord Atarka by Karl Kopinski. Dragonlord Dromoka by Eric Deschamps. Dragonlord Ojutai by Chase Stone. Dragonlord Silumgar by Steve Belledin. Dromoka’s Command by James Ryman. Narset Transcendent by Magali Villeneuve. Epic Confrontation by Wayne Reynolds. Haven of the Spirit Dragon by Raymond Swanland. Icefall Regent by David Gaillet. Necromaster Dragon by Mark Zug. Ojutai’s Command by Craig J. Spearing. Sarkhan Unbroken by Aleksi Briclot. Shieldhide Dragon by Chris Rallis. Silumgar’s Command by Nils Hamm. Thunderbreak Regent by Ryan Pancoast. All images © Wizards of the Coast LLC.